I am blessed with a lovely kitchen window which opens to a jasmine tree, standing between me and my neighbor. The tree embodies as many seasons as Montreal has to offer: short-lived purple blossoms; dense long lasting green leaves; colorful falling leaves; and snow covered bare branches, at times decorated with long icicles, in the whole duration of our long winters. I guess my kitchen’s window is partly responsible for my cooking passion! What makes spending time in the kitchen all more enjoyable however is the bird feeder I bought a couple of years ago. It feeds many birds and it creates a world around it which feeds my soul as well. 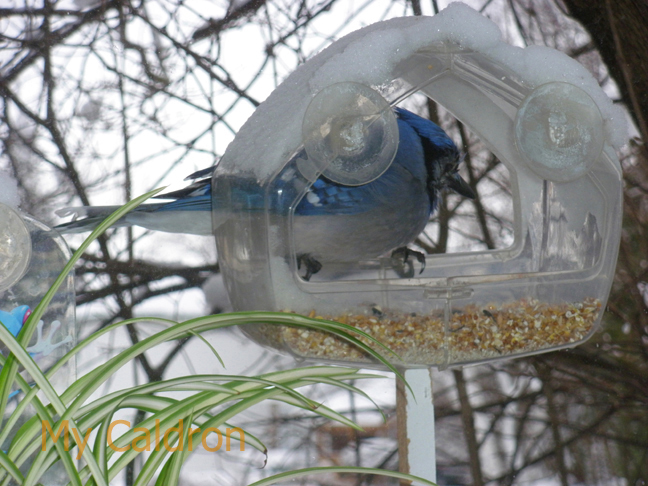 All it took to create this surprisingly entertaining, exciting, fun and indeed educational setting is: A window bird feeder [there are so many types of bird feeders, but the ones that stick to the glass are made for close up look. They might not be very durable but they are inexpensive and easily replaceable; more importantly this type of feeder cannot be ravaged by squirrels] One 4 kg. bag of “wild bird food” every three months in busy seasons (fall and winter), and every 5-6 months for the rest of the year (let’s say an average of 2 bucks per month]. And a regular schedule for cleaning the feeder. In busy season I clean it every two or three weeks, and I occasionally need to fix it back on its proper place. It is very important to clean the feeder with disposable gloves and NOT to put it in your sink or anywhere close to foods and dishes. Wild and migrating birds could be dangerous and carriers of diseases. 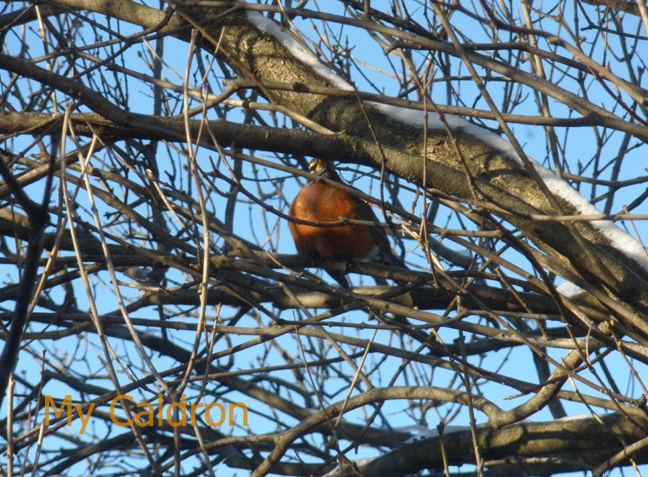 The two tiny birds, again mostly hanging around during winter, are chickadees and snow birds. I just LOVE the way they sit inside the feeder and take their time picking over the seeds, making a mess around them while once in a while looking me in the eye when I am facing the window washing dishes. 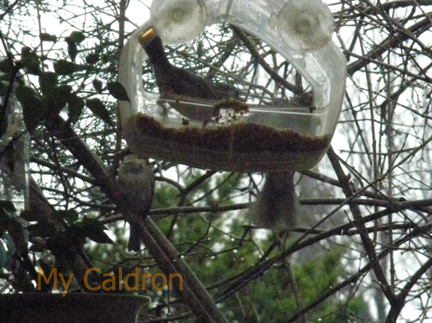 Did I mention I did not know the name of any bird species (save sparrows) before I bought the feeder? No, they don’t carry identification badges! I have a bird book guide and a bird-watcher husband! These are lovely pictures, and I love the beautiful way of expressing your feeling about different things. This is a gift that not a lot of people are lucky enough to have.